We invite you to explore India - the Land with infinite beauty ! Whether you soar high into Himalayas or peer under the ruins of the Ancient monuments dotting the landscape of India, you will cherish the experience long after your visit ! This India Travel Guide on St. Mary Queen of Peace Basilica Trivandrum is free from any commercial interest! This site is dedicated to promote India - the vast subcontinent, its glorious past, magnificent landscape and its infinite variety. The St. Mary, Queen of Peace Basilica ranks among the finest churches of India and is situated in the Palayam (Cantonment) area of the city of Trivandrum (now Thiruvananthapuram), in the state of Kerala. 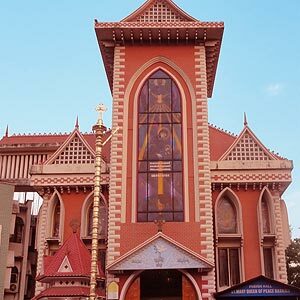 The foundation stone of this Cathedral was laid Archbishop Mar Ivanios in 1950 and he was enthroned as the first Archbishop of Trivandrum and the Head of the Malankara Catholic church. The Cathedral was consecrated by Archbishop Benedict Mar Gregorios on February 22, 1965. Pope John Paul II paid a visit to this Cathedral on February 8, 1986 as part of his India tour. Malabar region (Kerala as it was known) was a cauldron of culture from the early times. West coast on the shores of the Arabian sea with its vast treasures of spice and easy access to the West and Africa provided the perfect backdrop to burgeoning trade. Malabar Christians had adapted Syro Chaldean church from the middle east and subscribed to East Syrian liturgy for many centuries until the arrival of the Portuguese in the 16th Century. Portuguese sought to enforce the Western ecclesiastical traditions upon the well entrenched Eastern Syrian Christians. Padroado agreement of the Portuguese gave the complete control of the Church to the Portuguese king and the ecclesiastic hierarchy established in Goa tried to vest the control from the eastern Churches. This latinization resulted in breaking away of many Oriental Malabar Churches from Roman Catholicism and they adopted the Jacobite Sea of Antioch. After a tumultuous period of rivalry, the Syro Malankara hierarchy decided to come under the episcopal jurisdiction of the Roman Catholic Church, which was accepted by Pope Pius XI in 1932. It is the seventh basilica in Kerala - to be followed by the neighboring Tamil Nadu with 6 basilicas. The majority of the Basilicas in south India shows the spread of Christianity in South India. An unofficial study puts the number of ordained priests hailing from South India at a little over 45 % for the entire India. Leonardo Cardinal Sandri, the Prefect of the Congregation for the Oriental Churches, announced the declaration on 10 November 2008. Major Archbishop Moran Mor Baselios Cleemis Catholicos dedicated the church to St. Mary, Queen of Peace Basilica on December 7, 2008. The remains of Archbishop Mar Ivanios, Archbishop Benedict Mar Gregorios and of Major Archbishop Catholicos Moran Cyril Mar Baselios are rested in this pro-cathedral. This church was referred to as the Tin Church or thakara palli. This name dates back to the days when the church had a tin roof before the construction of a neo-Gothic structure.